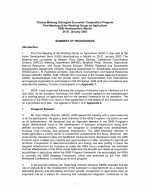 The First Meeting of the Working Group on Agriculture (WGA-1) was held at the Asian Development Bank (ADB) Headquarters in Manila on 20-21 January 2003. The Meeting was co-chaired by Messrs. Kazu Sakai, Director, Operations Coordination Division, (MKOC) Mekong Department (MKRD); Bradford Philip, Director, Agriculture, Natural Resources, and Social Sectors Division (RSAN), Regional and Sustainable Development Department (RSAN), Regional Department for Sustainable Development (RSDD) and C. R. Rajendran, Director, Agriculture, Environment, and Natural Resources Division (MKAE), MKRD, ADB. Officials from countries in the Greater Mekong Subregion (GMS), representatives from the private sector, and representatives from international and regional organizations participated in the Workshop. ADB staff and consultants also attended the meeting. WGA-1 was organized following the Inception Workshop held in Vientiane on 4-5 July 2002. At the Inception Workshop, the GMS countries agreed on the establishment of a working group on agriculture and on the general framework for its operation. The objective of the WGA is to reach a final agreement on the details of this framework and on a prioritized work plan.